Blade thickness at base: 12.5 mm (t-section), 4 mm (blade itself). 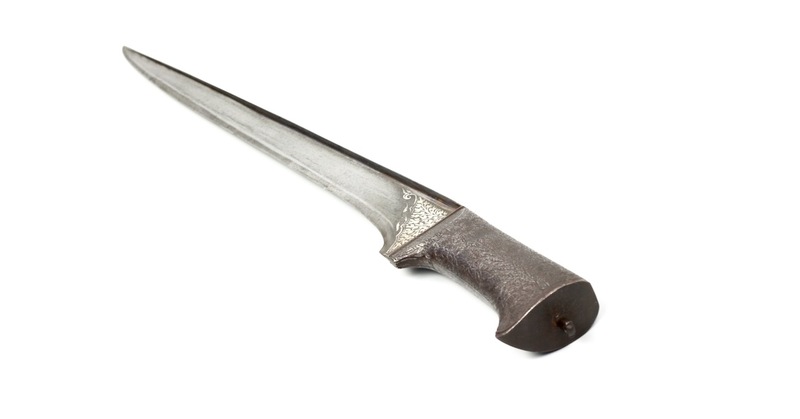 An unusually large version of a karud dagger with all-metal handle. 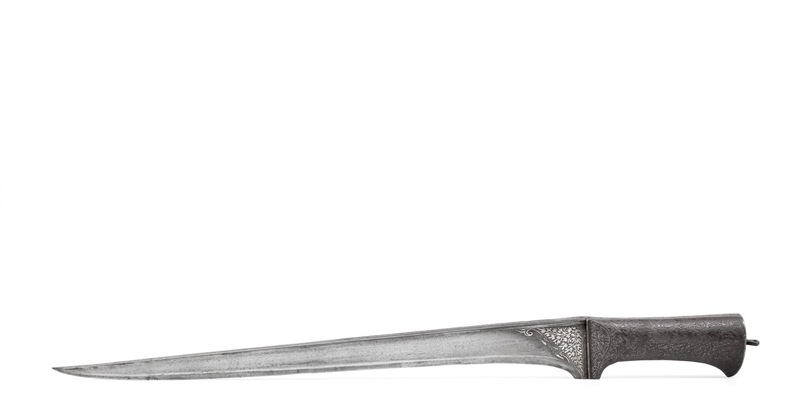 The blade with pronounced T-shaped spine section narrows gradually to an acute point. The pronounced T-construction is a clever design that accomplishes superb stiffness while keeping the edge thin for effective cutting. 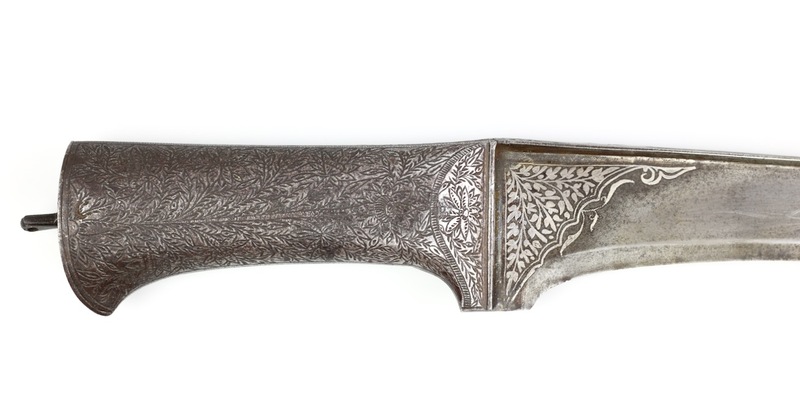 The base of the blade is decorated with silver damascening or " koftgari " of floral designs. 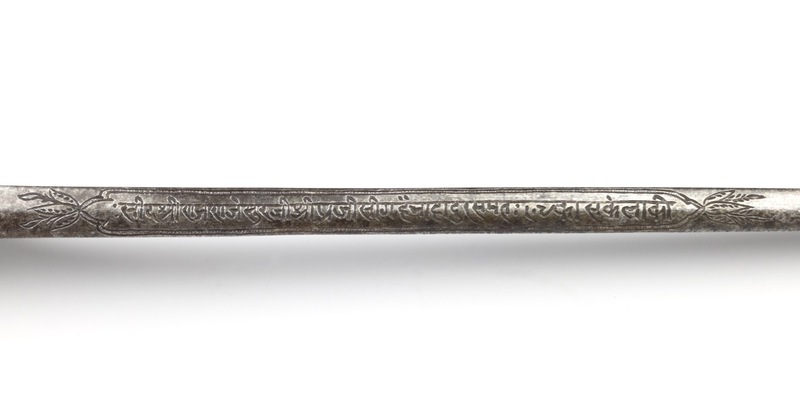 The all-metal handle is soldered with brass at the back. It is engraved with vegetal motifs and flowers. 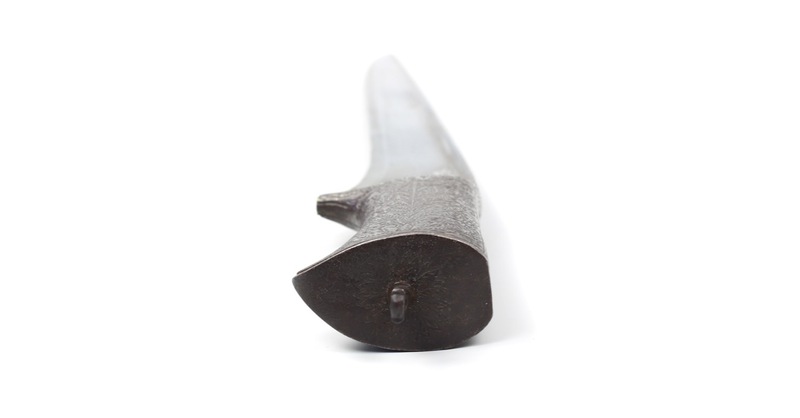 A screw at the pommel allows the back to come off, exposing the hollow inside of the hilt what was used to contain a whitish powder. 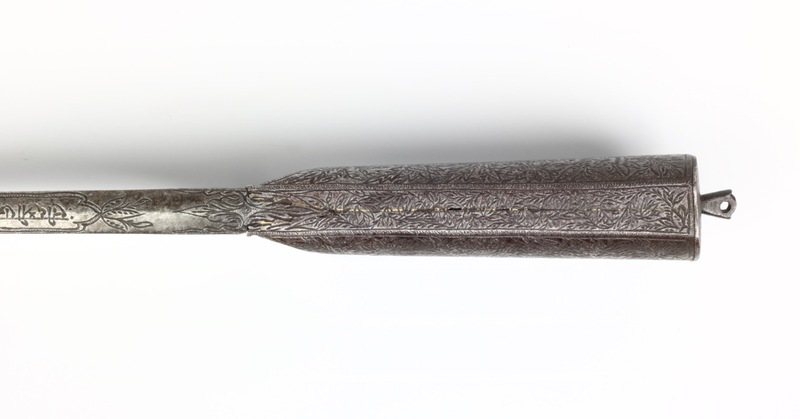 The spine of the blade bears an inscription in devanagari script referring to a certain ruler, Raj Rajeshwar, and the year 108, and that the blade is made of "sukhela steel". 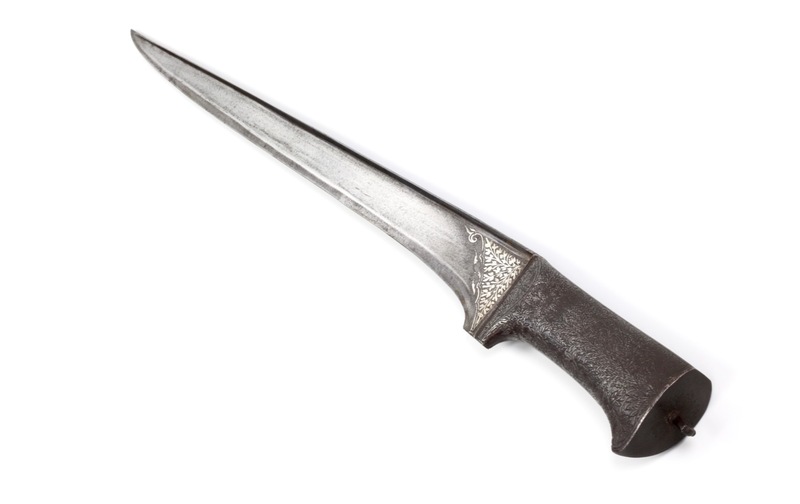 To anybody who can solve the riddle of who this was, and what Gregorian date the year represents, I'd offer this knife at a considerable discount. 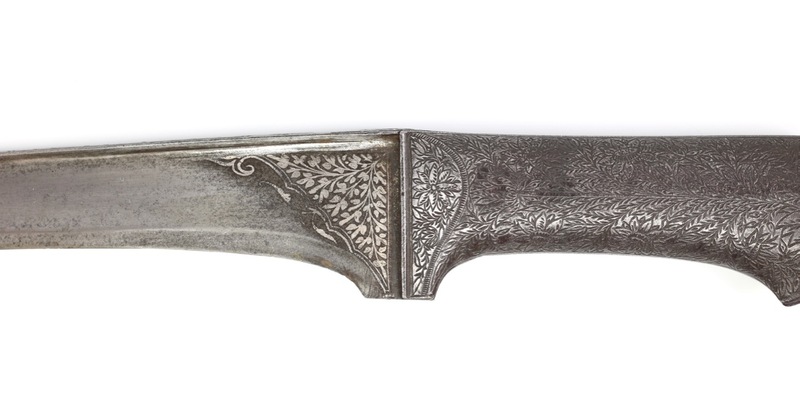 To star, sukhela is a type of mechanical “damascus” steel, made by forge folding layers of iron and steel with different compositions together to make a hard and tough blade. 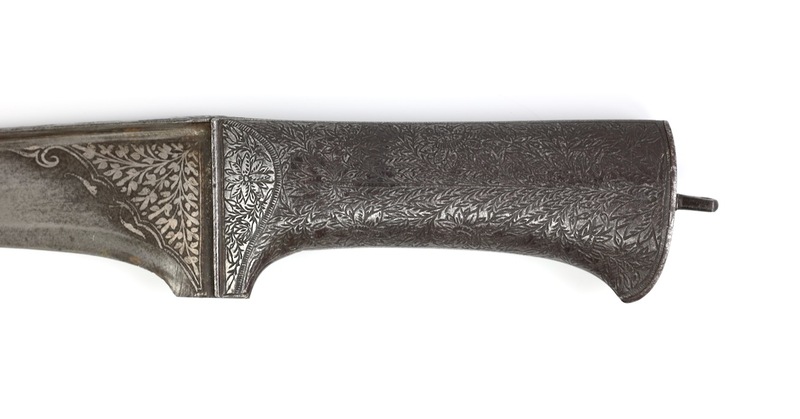 It's currently unpolished, but if it is sukhela steel, a polish should reveal such layering in the steel. The piece is in very good condition. Some minor signs of sharpening over the course of its life. 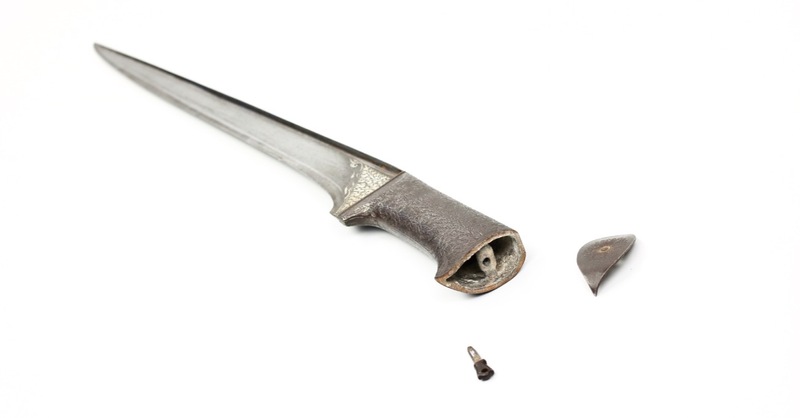 Some minor wear to the silver decor, probably from sliding in and out of its scabbard. (Now lost.) Decor on the handle in good shape, with no losses. The steel blade shows the usual darkening that can be expected on a blade of this age. No edge damage, no nicks, cracks or pits in the blade. 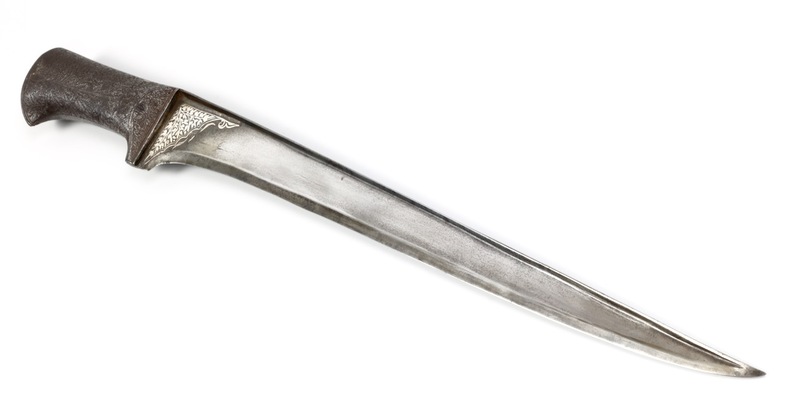 A large all-steel Indian dagger, of shortsword size. It has interesting inscription that makes a nice puzzle for the future owner that cares enough to investigate.